Aileen Brogan wants a place to call home. After leaving Ireland for America and losing her father and brother within a year of each other, she feels lost and alone. No matter how hard she tries, she just doesn’t seem to belong in the quaint town of Eagle Harbor. However, Sheriff Isaac Cummings is determined to help her fit in—into town and into his arms—if only she'll say yes to his courtship. But if he knew her secrets, he'd surely rescind his offer. Isaac is determined to serve the people of Eagle Harbor in a way that will do his family proud, but he’s haunted by past mistakes. When a band of criminals threatens his beloved town’s safety, he doesn’t want to fail the people he loves like he did four years earlier. But if he doesn't turn out to be the hero the town needs, what chance does he have of winning Aileen's resistant heart? Come visit the rugged yet beautiful coast of Lake Superior and the remote historical town of Eagle Harbor that readers can’t get enough of. Note: Love's Bright Tomorrow contains a character who was previously sexually abused. No instances of sexual abuse occur in the novel. Love's Bright Tomorrow is a historical Christian fiction book, the sixth and final book in the Eagle Harbor series by Naomi Rawlings. Though this is the first book I've read in the series I feel it stood well as a stand alone but I really look forward to reading the others in the series and seeing their stories. I have been hearing a lot about Eagle Harbor through reviews of this book and the others in the series and am so glad I finally had a chance to visit it myself. Sad and lonely after the loss of her father and brother within a short time period she just doesn't feel as though she fits in with life in Eagle Harbor . Struggling with her lack of self worthiness Sheriff Isaac Cummings wants her for his woman but she is very hesitant. Issac has a monkey on his back though as he is haunted by past mistakes that he feel he could have prevented. There was just enough suspense in it to keep me reading. I loved seeing how to two broken people helped each other heal. Beautiful book about dreams. We all have dreams and should do all we can to keep those dreams alive. I look forward to seeing what Naomi Rawlings has in store for us next. Published February 5th 2018 I received a review copy from the author and was not required to write a favorable review. Love’s Bright Tomorrow is a well written book. A wonderful story of faith, family, hope, courage and love. The characters are very well developed. You truly feel like you know them. I got drawn into this book and did not want it to end although I rarely read historical romance. It keeps you on the edge of your seat; definitely a page turner. Throughout this story the author weaves God's wondrous words and love along with lessons about trusting God while navigating through trials and tribulations. I received this book for free in exchange for an honest review. This is my honest opinion. I have read the Eagle Harbor series from almost the first book; each one has featured different main characters, but those who live in the community weave in and out of each novel. The result is that the reader gets updates on how earlier couples have fared and, as in this book, favorite characters from previous books get their own storyline. This time Isaac gets the chance to have his own happy ending, even though the events leading there are filled with difficulties. This really is a book about healing from the past, whether the wounds happen through the character’s choices or as a result of things that have been inflicted on them. Both the hero and the heroine are wounded, which makes them ideally suited for one another, if they can allow the healing to happen. Interestingly enough, each of them has a key piece of the puzzle for the other, a solution that comes from personally understanding the damage done. For example, Isaac is able to point Aileen to God’s mercy, to help her see that there is enough there to cover her. The irony here is that, while he understands God’s mercy for Aileen, Isaac has trouble seeing it for himself, feeling immense guilt over his father’s death. He has been carrying around that burden for the entire series, and this book allows us to see him deal with those issues. I loved watching the other characters, Aileen in particular, rally around him—it is a great illustration of how we need each other, how believers can support and speak into other lives, also receiving encouragement when necessary. No one can be strong all the time. There is one particular character that did not get an ending to her story, which left me a little frustrated at the end of this novel as I know this is the final book in this series. Thankfully, though, Rawlings gives us a note telling us her story begins the next series, set to debut next year. I thoroughly enjoyed this story of healing and hope rather than unattainable perfection. The characters are ones I have grown to love, and while I’m sorry to see the series end, I close this book with a happy sigh, knowing I can revisit any time I like. I highly recommend this book, this series, to those who enjoy historical romance with realistic, engaging characters, though to readers 16 and up, due to some elements in one of the character’s backstory. I received a review copy of this book from the author but was under no obligation to post a review. The opinions expressed are both honest and my own. Well, I just stayed up far too late to finish this book! What a fantastic ending to Naomi Rawlings' Eagle Harbor series. Love's Bright Tomorrow brings back all the friends I met in the previous books and expands on each of their lives since the completion of their respective stories. I'm going to miss these fictional people! Aileen Brogan has been fending off Sheriff Isaac Cummings' interest almost since the beginning of the series so when Love's Bright Tomorrow focuses in on Aileen, it's almost a relief to find that she's not as indifferent as she tries to appear. Can she get past the stumbling block in her mind to take a chance on love with Isaac? Isaac took the sheriff's job when fear drove him from the family fishing boat. He feels broken, less than, and like he doesn't have much to offer. Aileen makes him want to be a better man. When danger comes to Eagle Harbor, can he keep the town and Aileen safe from the evil that seems to keep placing her in the middle of the action? With themes of God's mercy and grace for our human mistakes, or in some cases our misplaced guilt, Love's Bright Tomorrow gently points readers to a God whose love is sufficient for any downfall. There's plenty of action to keep readers flipping pages (and staying up WAY too late!) to see how the hero or heroine gets out of their latest mess. I love that the Eagle Harbor series is set in Michigan's UP - a place I've actually visited. I have no trouble picturing the vastness or the wildness of Lake Superior, partly because I've been there. Ms. Rawlings does a stellar job of taking me back there with each Eagle Harbor book. I'm going to miss these mental trips to Michigan! 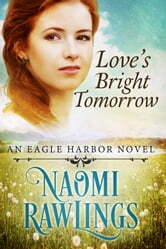 Love's Bright Tomorrow will appeal to the historical romance reader, especially. There's enough suspense and mystery to keep readers who like a little more excitement happy, too. It can be read as a standalone novel but is so much better read as part of the series. I highly recommend!